The Goddess Persephone is a paradox. At Beltane, Persephone is an innocent maiden, the harbinger of spring, new beginnings and joyful youth. At Mabon Persephone is the Dark Queen of the Underworld, Goddess of the soul who possesses it’s dark and frightening mysteries. As maiden, she brings forth new life when the Earth begins to waken from a long winter’s sleep. As Dark Queen, Persephone rules the Underworld, and with her sickle, is prepared to reap what has been sown. Persephone is the daughter of Demeter and Zeus, and was conceived long before Zeus married the jealous and vengeful Hera. By all accounts, Persephone lived a very idyllic childhood, she was well loved by her mother, and had two sisters to play with – her father’s other daughters, Athena and Aphrodite. As a child she was called Kore or Cora, meaning young maiden. She was a very pretty child who grew into a lovely young woman. One day she caught the eye of Zeus’s brother Hades, who wanted to take her as his wife. Hades knew that Demeter would never agree to their marriage, so he went behind Demeter’s back and made arrangements with Zeus to abduct and marry Persephone. One day while Persephone was in a meadow picking narcissus flowers, the earth opened up, and Hades kidnapped her. Demeter heard Persephone’s screams and immediately began to search for her daughter. 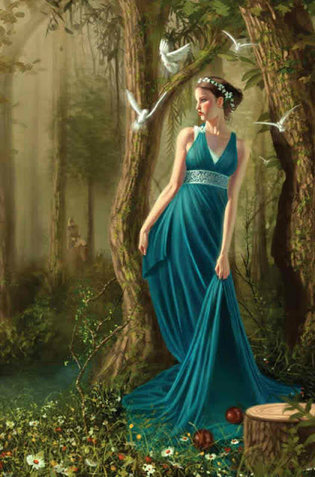 After learning of Zeus’s bargain with Hades, Demeter became very angry and withheld her blessings to the earth. The land grew dark and cold, crops withered and died and the earth was plunged into perpetual winter. Demeter wandered the length and breadth of the earth in search of Persephone. Meanwhile, Persephone had come to care for her new husband, and was torn between loving Hades and missing her mother. She missed the light and warmth of the upper world, yet her new husband was loving and attentive, she was enjoying her role as Queen of the Underworld, and she didn’t want to leave Hades forever. Persephone decides to eat six seeds of pomegranate, knowing full well that eating the food of the dead in the Underworld, will prevent her returning to the upper world forever. On Earth, Zeus relents and sends Hermes to the Underworld to bring back Persephone. The six pomegranate seeds that Persephone ate were enough to prevent her from returning completely to her mother, so a bargain was struck between Demeter and Hades. Persephone would spend half the year with her mother and half the year with her husband. Each year when Persephone returns to Demeter, the warmth of spring returns to the Earth, but when Persephone returns to the Underworld, Demeter’s grief brings on the cold of winter until Persephone’s return in the spring. Thus the seasons were established. Persephone was a gracious hostess to guests who visited the Underworld, and was willing to help them with their problems. When Psyche asked for help to reunite with her husband, Persephone gave her a magick beauty potion. Persephone loaned Hercules the three headed dog Cerberus, guardian of the gates of the Underworld, so that Hercules could complete the Twelve Labours that he had been assigned to atone for his wife’s death. Persephone helped Adonis hide from Aphrodite’s husband, and consequently fell for the handsome youth herself refusing to give him back to Aphrodite. Eventually Zeus had to step in and settle the argument by ruling that Adonis would spend a third a year with each Goddess. The rest of the time was Adonis was free to pursue his own interests. MANIFESTATIONS: Persephone manifests as a beautiful young woman.